The Cooch Behar Court has issued a notification for the Cooch Behar Court Recruitment 2018-2019. Therefore, we have provided all the details in this article for the sake of aspirants. So, applicants can refer the whole page to get the details about the Cooch Behar Court LDA, Group D Recruitment 2018-2019. And, the Cooch Behar Court released a Cooch Behar Court Notification 2018-2019 for the 50 LDA, Group D, English Stenographer Grade-III, Process Server, Karma Bandhu vacancies. Moreover, the application process has started a few days back and it will be closed on 25th April 2018. Furthermore, the contenders can find the Educational Qualification, Age limit, Pay Scale details in the below sections. In addition to this, we have arranges the Steps To Apply For The Cooch Behar Court Recruitment 2018-2019 at the bottom of this post. Many of the competitors are waiting for the Cooch Behar Court Recruitment 2018-2019. So, the Cooch Behar Court has released a notification for the sake of candidates. 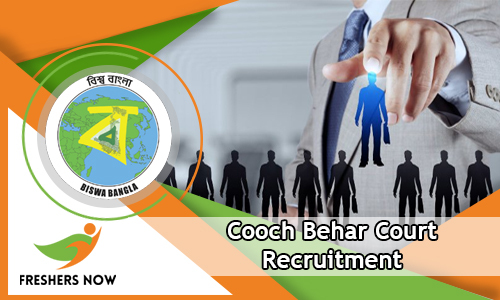 Therefore, the applicants who are hunting for jobs in Cooch Behar Court need to apply fastly. Moreover, we have attached the link to download the Cooch Behar Court Notification 2018-2019 at the end of the post. And, all the details related to the Cooch Behar Court Recruitment 2018-2019 are available in the site cbdcjobs.net. In addition to this, we have gathered the same details on this page. Hence, aspirants need to refer the whole article to get clarity about the Cooch Behar Court LDA, Group D Recruitment 2018-2019. From the above table, aspirants can get the details related to the Cooch Behar Court Recruitment 2018-2019. So, the candidates need to apply their applications through online mode fastly. And, the forms which are submitted after the last date will be rejected by the organization. Moreover, applicants need to check all the qualification before applying for the Cooch Behar Court Recruitment 2018-2019. Competitors can get the educational qualification details from this section. Moreover, before starting the process to fill the application form the aspirants need to refer this page. Lower Divison Assistant, Stenographer: The candidate must have passed Madhyamik or equivalent education from a recognized board and at least a certificate for Computer Training. Process Server: The candidate must have passed Madhyamik or equivalent education from a recognized board and must have knowledge in reading and writing Bengali and English. Group D: The candidate must have passed the 8th class or equivalent education from a recognized board and must have knowledge in reading and writing Bengali and English. Karma Bandhu: The candidate must have knowledge of reading and writing. So, the aspirants who had applied for the Cooch Behar Court Recruitment 2018-2019 need to wait for few more days to know the examination date. Moreover, we will update the up to date information on this page. So, applicants can stay tuned to this article to know the latest updates. And, the Cooch Behar Court is planning to conduct the written test for the applied competitors. Therefore, candidates need to prepare well for the examination. Furthermore, we have provided the syllabus and previous papers on our website. So, aspirants can download and start preparing for the test. Moreover, for the written examination there will be a cut off marks to qualify the candidates. Therefore, we suggest the aspirants prepare well for the exam. Moreover, the candidates need to between 18 years and 40 years to apply for the Cooch Behar Court Recruitment 2018-2019. Furthermore, the age limit details are mentioned in the below sections. So, contenders can refer the below sections of this page to get all the details about the Cooch Behar Court LDA, Group D Recruitment 2018-2019. And, the aspirants can get the pay scale according to their positions. In addition to this, competitors need to pay the fee along with the form submission through online mode. The last date to pay the fee is also 25th April 2018. The details regarding Cooch Behar Court Recruitment 2018-2019 are available on the web page which is given in the above sections. So, the aspirants need to open that page to fill the application form. Age should not be less than 18 Years and not more than 40 Years as on November 1st, 2017 for all the position except for the Stenographer. The age limit for the Stenographer is 39 years. Relaxation of age for five years for the SC/ST candidates and three years for the OBC aspirants. We have provided all the particulars regarding Cooch Behar Court Recruitment 2018-2019 on this page. So, for more updates candidates need to check our website freshersnow.com. And, for more clarification leave a comment in the below comment box.